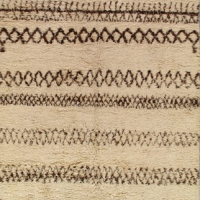 Rugs acquire a patina of age when used. Vintage rugs are those of the 1940's and later which have developed real character. The colors have softered, the pile is shiner and the look is mature, but the condition of the rug is still very good. Vintage rugs often have designs and colors not found in truly antique pieces.